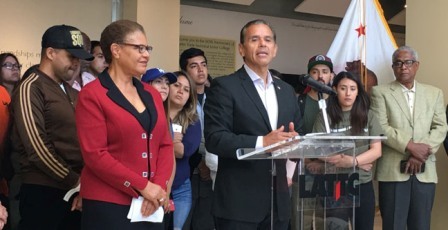 Congresswoman Karen Bass has endorsed former Los Angeles Mayor Antonio Villaraigosa for Governor 2018 at Los Angeles Trade-Technical College, one of his most prominent endorsements from the African American community so far. According to the 2015 U.S. Census Bureau, it’s estimated that Black voters make up 6.5% of the state’s population but hold a stronghold when it comes to the democratic vote. 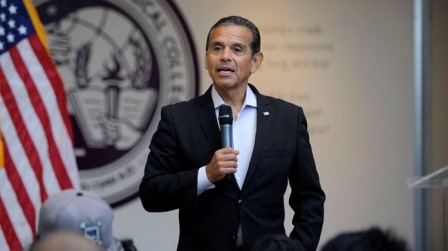 African Americans helped Villaraigosa win his bid for mayor in 2005. Villiarogosa has been traveling the state of California having listening to sessions; his website states his campaign is about—giving voice to everyone and that’s what his service as governor will be about—making sure the people are heard in Sacramento and their priorities are addressed. The 63-year-old remarried last year to Patricia Govea. Candidates for California 2018 Governor’s race include Lt. Governor Gavin Newsom, State Treasurer John Chiang, former state Superintendent of Schools Delaine Eastin, Assemblyman Travis Allen, Attorney John Cox, Writer and real estate investor ZoltanIstvan and former Los Angeles Mayor Antonio Villiarogosa.